We teased you recently with a dyno shootout between the Aprilia RSV4 RF and the Ducati Panigale V4 S, with the Ducati blowing the doors off the less powerful – and smaller displacing – Aprilia to the tune of 187 hp for the Panigale and 168 hp for the RSV4. This set the stage for our track shootout between the two Italians nicely, as on paper, anyway, the Ducati seemingly has the Aprilia’s number. A bigger engine clearly gives it a power advantage, while 20 pounds less mass on the official MO scales and electronic Öhlins suspension prevails over the RSV4’s extra heft and manual Öhlins bits. But what does that all translate to once the tire warmers come off and fast lap times need to be set? Three tenths of one second. That’s all that separated the Aprilia RSV4 RF and Ducati Panigale V4 S on the West Track at Utah Motorsports Campus. The rider? Shane “Tornado” Turpin, the current lap record holder, multiple-time number one plate holder, and World Superbike wildcard rider. With all the hype surrounding Ducati’s new flagship sportbike, and our own love affair with Aprilia’s V4 wonder, we were shocked to see the two come down to the wire like this, especially since we thought the fast nature of UMC’s West Track would suit the Ducati’s power much more than the Aprilia. The shutter speed on Brasfield’s camera when he took this shot was slightly faster than three tenths of a second…but not by much. Since you’re likely curious about lap times at this point, here you go: The Aprilia turned in a time of 1:31.5. The Ducati? A 1:31.2. If you’re wondering, Turpin’s lap record is a 1:28.5, aboard his full-blown superbike. Other than fitting Pirelli Diablo Slicks to both machines, the Aprilia and Ducati were completely stock – lights, blinkers, and even the horns still in place. Both motorcycles were running on 91 octane fuel, straight from the local gas station. But one fast lap time does not a V4 champion make, and to determine a winner strictly based on lap times (especially one lap time), would be a fool’s errand. Let’s take a step back, then, and allow me to explain the parameters of our track test. Fairness and equality are what we strive for when doing comparison tests. We asked each manufacturer if they wanted to participate, explaining to both that a faster lap time does not automatically determine a winner. From there, we demanded both machines be entirely bone stock, as they roll off the production floor. Running both machines on the dyno prior to our test helps determine if the players are abiding by the rules; it wasn’t unusual in years past for a motorcycle to run extremely lightweight oil simply to pad the dyno number. 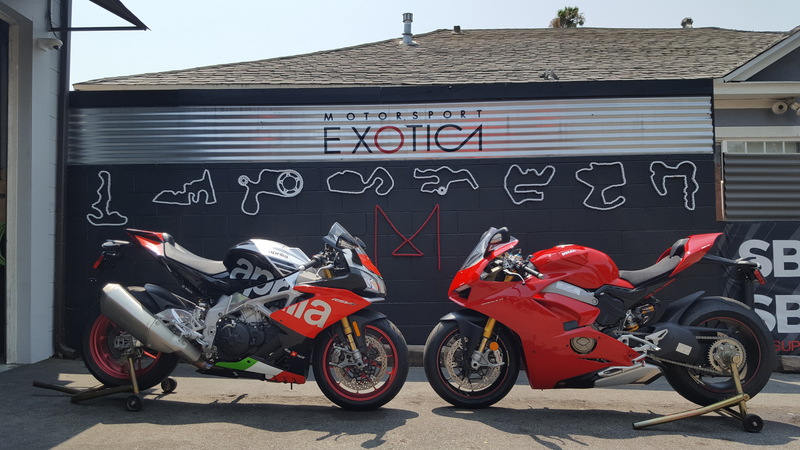 In our case, the power ratings from both bikes fall in line with the numbers our dyno operator, Motorsport Exotica, have seen on other Panigale V4s and RSV4 RFs. Filling up tanks and putting both on the official MO scales also helps us weed out any tricks as far as reducing weight go (granted, recent memory can’t recall any time a manufacturer has done such a thing). A special thanks to our friends at Motorsport Exotica for getting these two Italian stallions onto the dyno on such short notice. If you’re wondering, those racetracks on the wall are made from motorcycle chains. Normally, we do our tests at public trackdays, which typically have 30 riders on track and never allows us to record a proper fast lap time. This time around the awesome guys at Rickdiculous Racing welcomed us to share the track with them. With something like 10 people on the track at any given time, often we had the asphalt all to ourselves, meaning we could have Turpin set a fast time on both bikes using the Aim Solo 2 GPS lap timer. With that in mind, we decided the only change we’d make to the bikes was to swap the stock (already excellent) rubber for something better. To that end the folks at Pirelli were kind enough to send over some Diablo Slicks in the SC1 compound, leaving no doubt that we’d have plenty of traction. Riders for the bikes would be Turpin, myself, and former-MO-staffer-turned-healthcare-provider Tom “Biceps” Roderick. This is not a playground for beginners, so the combined riding experience of a world-class racer, one journalist hack, and Tom (a competent trackday A-group rider) gives a broad perspective when it comes to motorcycles as powerful and advanced as these. Another shoutout to Adam, Ken, Josh, and the rest of the Rickdiculous Racing crew for their hospitality and allowing us to share the track with them. Stay tuned for a separate story about the Rick school. Coming soon. 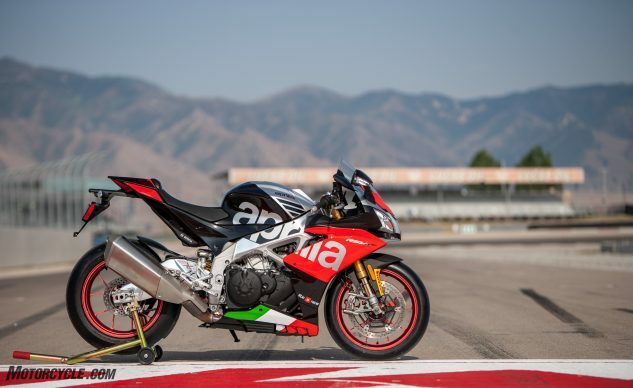 Much has been written about both machines here, so if you need a refresher on the technical specs on the Aprilia, I suggest reading former EiC Kevin Duke’s First Ride of the current generation RSV4. 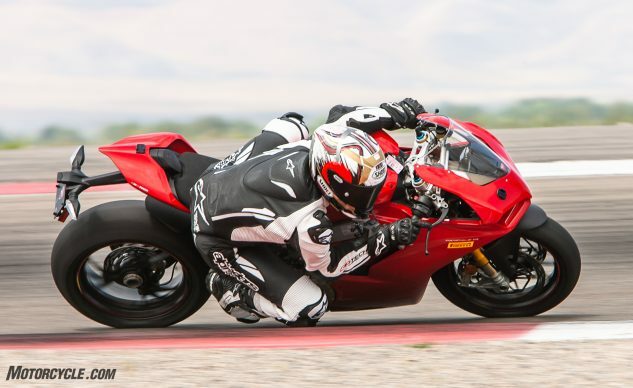 The Dukester was also one of the first to ride the Ducati Panigale V4 S, which you can read about here. And if that isn’t enough detail for you, our own John Burns took a break from his usual hot tub and margarita siestas to pen this highly detailed and informative First Look at the Ducati Panigale. In case you hadn’t noticed, Ducati is serious about the Panigale. Longtime readers will also remember Ducati have been reluctant to enter the previous V-Twin 1299 (or 1199) Panigale in past literbike comparison tests. At times, it was because none were available in Ducati’s press fleet. Other times, we think Ducati USA simply didn’t want to enter a competition it couldn’t dominate. 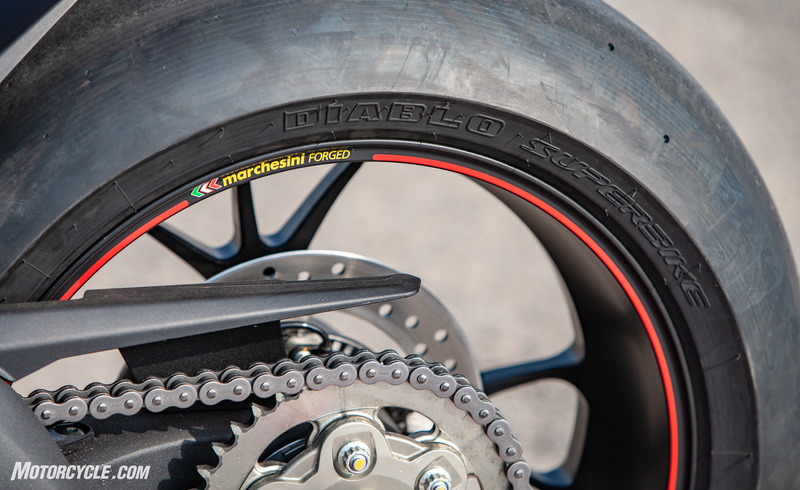 One final thanks goes to Pirelli for supplying Diablo Superbike slicks for both bikes in the SC1 compound. These are the same tires used and developed by the World Superbike paddock, and the consistent grip provided gave us plenty of confidence to go as fast as we dared. This makes Ducati’s eagerness to be included in this comparison especially interesting. It’s also a special occasion for MO, as we are the first U.S. publication to get our hands on a Panigale V4 on home soil. But enough about getting emotional, let’s get down to business – how do these two stack up against each other? All three riders have experience with the RSV4, so it was only natural to use the Aprilia as a benchmark. As usual, its linear power delivery, accompanied by its intoxicating exhaust howl stirred our senses. Meanwhile, the chassis that Max Biaggi helped develop made us feel like the Roman Emperor at times; it’s sublimely communicative, planted, and secure – leaning over and carrying corner speed was no problem. So comfortable was I on it that, by my fourth lap of the day, the tarmac was collecting samples of my elbow slider. “The Aprilia has been in development for a decade, whereas the Panigale is just beginning its development cycle, but the RSV remains, without a doubt, the most stable, confidence-inspiring production motorcycle to ride around a racetrack,” says Tom. The old glove analogy has been used to death, but it’s apt when describing the RSV4 RF. It’s instantly comfortable and familiar from the start. Meanwhile, the Ducati lives and dies by the strength of that monumental Stradale V4 engine. With 187 clydesdales eager and excited to hit the pavement, twisting the throttle releases an explosion of power that wows the senses. But where the Aprilia is a testament to the fine balance between power and control, the Ducati separates the men from the boys. The chassis surrounding the new V4 – itself a major stressed member – isn’t as cooperative or precise as the Aprilia’s. 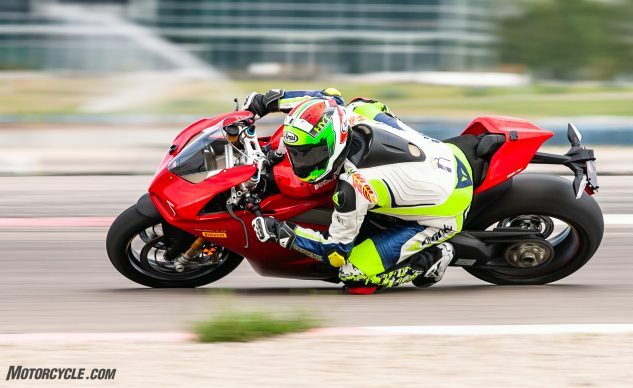 When you decide it’s time to move with the Panigale, it takes that command seriously, and it’s everything the Pirelli Diablo slick can do to drive you forward instead of sideways. Meanwhile, all that bucking and movement that comes from putting power to the ground is delivered right to you, the rider. Keep in mind the Ducati’s extremely sophisticated rider aids are quelling some of that madness, which makes the amount still getting to the rider eye-opening. The difference in styles between the two is crystal clear: the Aprilia is all about carrying corner speed, while the Ducati is the epitome of point-and-shoot. Diving on the brakes into the corner, the Panigale is eager to slow and trail brake, its Stylema calipers reminding us once again how good top shelf Brembo components really are, but once leaned over the chassis has a hard time communicating with exacting precision where the front tire is. And because it’s difficult to tune chassis flex into the frame when the engine is a major stressed member, low frequency stutter bumps that would normally be a blip on the radar screen are big jolts you can feel from the Ducati’s bars. The RSV4 is the scalpel to the Panigale V4’s steak knife. Both are sharp, but one’s clearly more of a precision tool. With its 104cc displacement advantage over the Aprilia, and the horsepower that goes with it, once you decide to release all of the Ducati’s power you better hang on. In speaking with Tom and Turpin separately, both mentioned their love for the Aprilia frame and chassis, while being in awe of the Ducati’s engine. I’m in unison with the others, as the two Italians really stand out in these respective areas. That said, the RSV4 is not slow by any means. It’s V4 engine still barks the most melodious sound we’ve heard from a production sportbike (the Triumph’s 675 and 765 Triples also ranking up there), with smooth yet powerful delivery. Longtime readers will know how much we love the Aprilia’s V4, and this latest example is no different. However, as the saying goes, absolute power corrupts absolutely, and the Ducati’s engine has corrupted us. 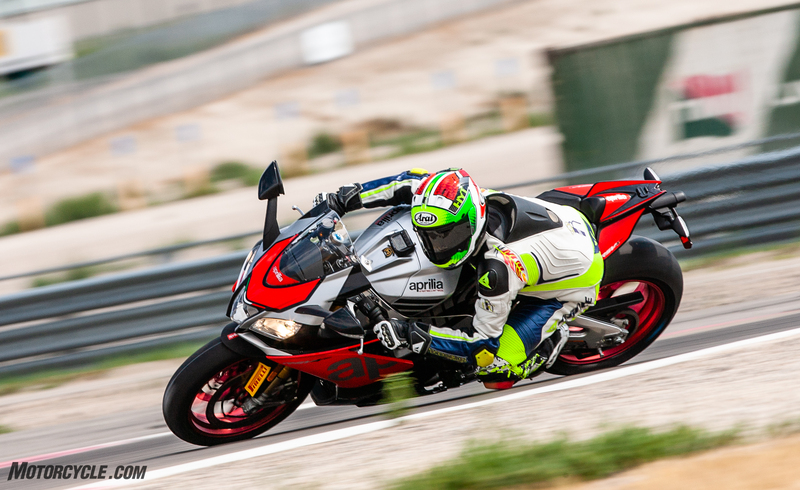 Perhaps the Aprilia’s greatest advantage is its ability to carry tremendous corner speed. In fairness to the Ducati’s handling, the electronics suite in the S model we tested is quite impressive at being able to change the attitude of the bike through a series of button clicks. Also impressive is the fact these clicks are not very difficult to navigate. With the S, two suspension modes are available – Fixed and Dynamic – the former allowing you to make suspension changes to the spring preload, rebound, or compression damping settings, as you normally would with a traditional suspension setup, only at the push of a button. In Dynamic, the rider can make changes to the motorcycle attitude – under braking, on acceleration, or leaned over – with adjustments affecting the action of both the shock and the fork. When you start to push it to the limit, the Panigale V4 S could be more communicative. Needless to say, the Panigale comes loaded with tech that harnesses its six-axis IMU as its leader, but for track riding technologies like cornering ABS, traction control, and slide control are the big ones we care about, all of which are tunable for different settings and intervention levels. Perhaps the biggest testament to the Ducati’s electronics is the fact I didn’t notice if or when it was intervening. Never did I experience any ABS intervention on the brakes, though I’m sure traction control must have kicked in when we let the ponies loose on exit. Perhaps there were too many other sensations flooding my brain to notice TC or SC working, but the fact the only limit to going faster was the monkey behind the controls speaks volumes to how far tech has come. Similarly, the Aprilia is quite tech-heavy, too, though we’ve become so familiar with it that its fluid nature doesn’t surprise us anymore – it’s just expected. Yes, the RSV4 lacks slide control, but its traction control system is still the only one of the two changeable on the fly via clever finger or thumb paddles. Maybe more impressive is the V4-MP app (yes, as in phone app) that allows specific traction and wheelie control settings be applied for specific turns on a racetrack. Admittedly, we didn’t get to test this feature, but the fact it exists for a production motorcycle is impressive. When it comes to picking a track bike between the two, the answer was clear for all three testers, though in very different ways. We all agreed the Aprilia was clearly the easier bike to ride, and despite the fact it was 0.3 second slower than the Ducati around UMC’s West Course over one lap, Turpin said, in a 10-lap race, he could run a 1:31.5 lap on the RSV4 for all 10 laps. Meanwhile, he admitted the 1:31.2 he pulled on the Panigale he could probably only muster for four laps. Despite it all though, Turpin being the racer he is – and the Ducati racer he was until he retired three years ago – he still picked the Ducati as the one he’d put in his garage. The reasoning is surprising, but otherwise simple. “As a racer,” he said, “I want the power. Then I’ll throw money or somehow figure out a way to make the thing handle.” In case you were wondering, yes, this is the mentality of top-level racers. Handling is much easier to come by than horsepower, and money is no object. Meanwhile, mere mortals like Tom and I have very different feelings. Neither of us will ever be a wildcard rider on a World Superbike grid, and if we were to buy either of these two, it would be to enjoy on the racetrack at a trackday (in the fast group, of course). And when it comes to having fun while going fast and not having to work hard at it, the Aprilia just can’t be beat – at least not yet. The Ducati, while fast, is a lot of work, both physically and mentally. 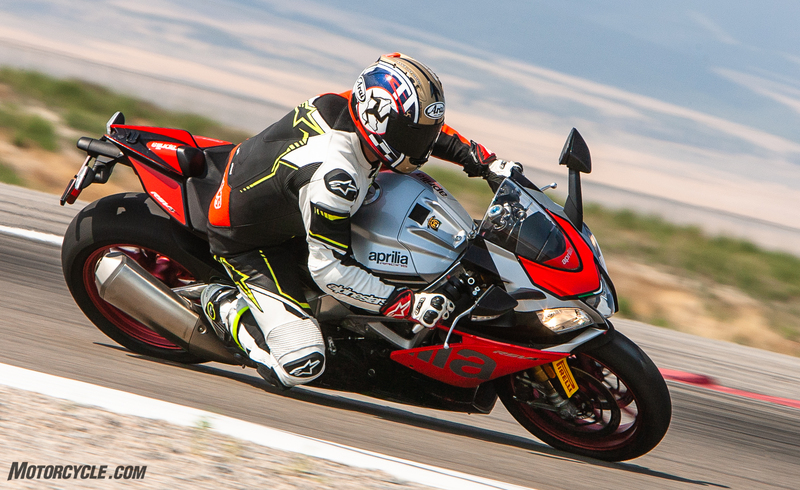 With the RSV4 it’s simply easy to go fast – and it’s rewarding, too. 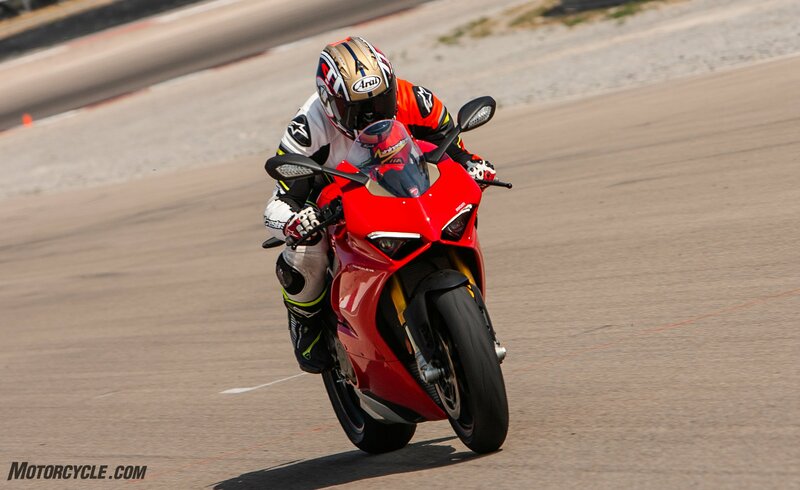 When you get it right, which you will a lot more often than on the Panigale, everything feels easy. A sublime handler like the Aprilia inspires confidence, and confidence is key for going fast over and over again. 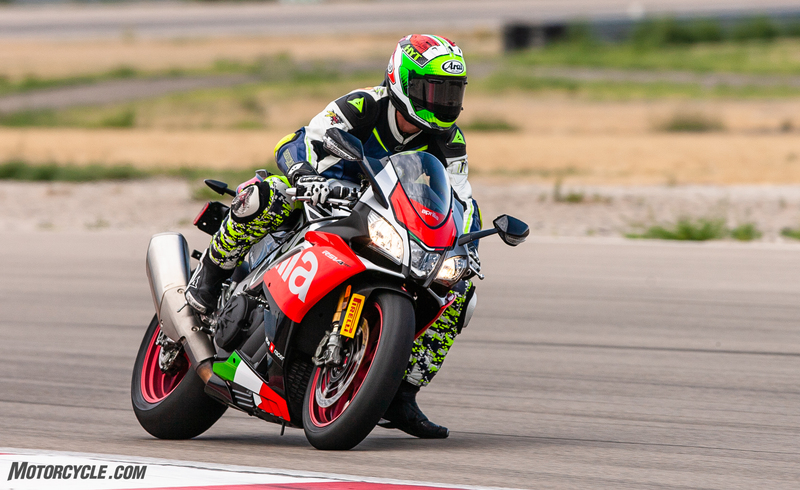 As the Aprilia nicely demonstrates, power isn’t everything when it comes to getting around a racetrack as fast as possible. But wait, there’s a twist. After Tom and I had a chance to sit down, write our thoughts, and fill out the trusty MO scorecard, Tom and I had a difference of opinion after all – Tom narrowly picked the Ducati! When all the scores were tallied, the final results show the Aprilia at 95.34% and the Ducati at 95.45%, with Tom’s Ducati scores narrowly tipping the scales for the Panigale. “It doesn’t happen often, but there have been a few times in the past where the bike I’ve chosen doesn’t match with the scores I entered in the Scorecard. This is one of those occasions. I feel as though the Aprilia is the better bike by a very slim margin, largely because of its ability to lap a racetrack and make me feel like the metronomic Jorge Lorenzo laying down consistently fast laps within tenths of seconds of one another. Only after returning to the office and honestly entering scores into the Scorecard do I find out the Ducati actually wins by the slimmest of margins. How is this possible? It’s the subjective me vs the objective me. Ask me to this day which is the better bike between the Aprilia Tuono and KTM Super Duke R, and my answer will vary by the hour. If you look at the scorecard, then the Ducati is technically the winner of this test. But ask Tom or myself which we’d rather have – for the track at least – and the choice tips in favor of that other Italian motorcycle. Personally, I stick by my choice of the Aprilia. With a decade of refinement, the RSV4 is still one of the most exciting liter-class sportbikes in existence. 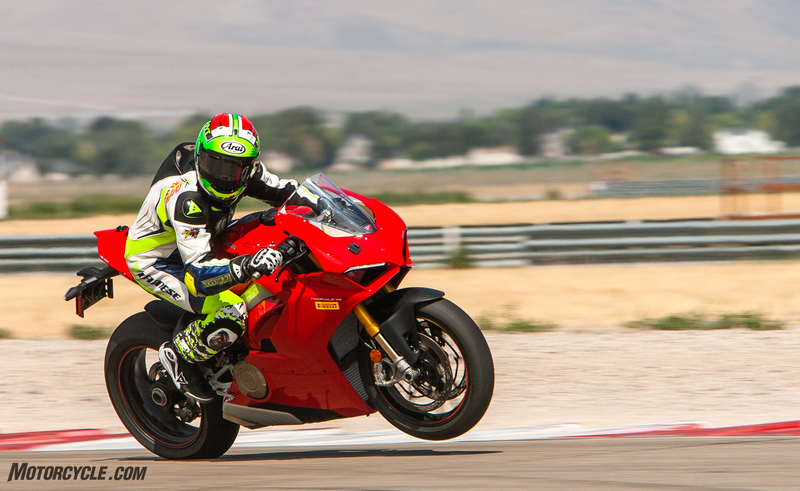 For a first attempt, the Panigale V4 S is an impressive motorcycle. Give it a few years and there’s no doubt Ducati will smooth out the edges and deliver a motorcycle with a chassis to match that engine. 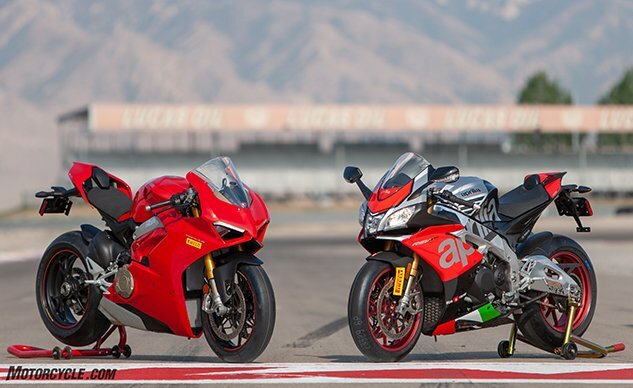 In the end, this test merely proves that both the Aprilia RSV4 RF and Ducati Panigale V4 S are remarkable machines to rule the racetrack, and the one you should choose really should come down to which one tugs at your heart strings more. Stay tuned for our street comparison, coming soon! Get price quotes for Aprilia from local motorcycle dealers.